It is the end of the first calendar year after we founded überproduct. Here a small collection of the talks and interviews we gave in 2013 – where recordings are available. First we want to share the conversation that Markus that Markus had with Joe Dager in the setting of his brilliant podcast. We already wrote about what great a guy Joe is and how well he organizes his work, site and podcast. 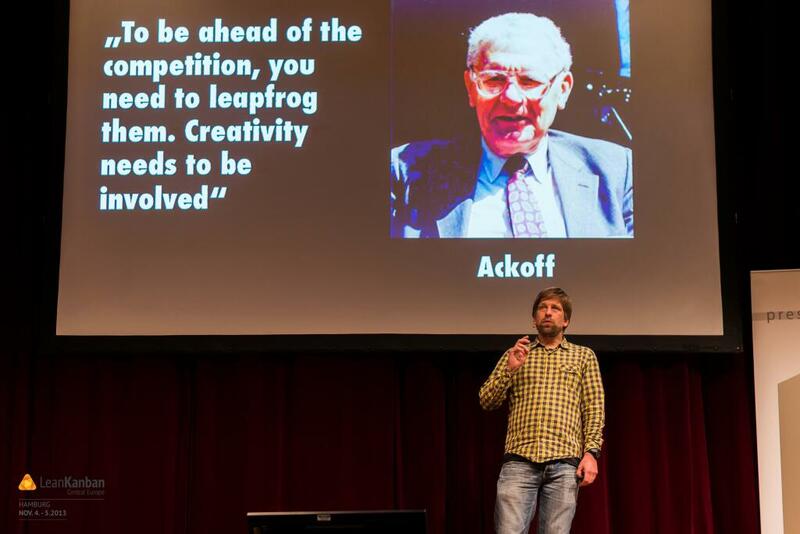 Use the following link to listen to the podcast that was recorded some weeks before the LKCE13 conference. In the podcast we talk a lot about the clash between highly non-linear and unpredictable work in product problem discovery – aka upstream processes in companies and the more linear nature of downstream activities in production. At the LKCE13 conference, Markus went more in depth on that topic and presented ‘The Boundaries of Kanban’. In his talk, Markus makes the point that there are two different sides in enterprises that have to be present and made explicit. One is the very much required and traditional analytic mindset, which is used to make predictions from the past. We use this ‘mode’ for keeping the business up and maintaining our products. When we want to discover new knowledge, want to discover and then solve new relevant problems, we need to come up with something else. Here we use abductive reasoning. This requires different ways of working, which are highly unpredictable and much more non-linear. To people working in a strictly linear environment, this is mind-boggling. We need to make explicit, that companies who want to solve new customer problems, need both ways of thinking and doing in their companies. But is is even more important to also make explicit where which way of thinking is deployed and used and why. Let’s be clear: Kanban takes care about doing things right and it does this well. Finding out what are the right things to do is orthogonal to Kanban – and this is solved by e.g. by Design Thinking, Design Studio or any other creative or innovation ‚process’. Boundaries of Kanban – disruptive innovation (Markus Andrezak) from Lean Kanban Central Europe on Vimeo. Finally, there was an interesting Interview with Dave Gray – author of “The Connected Company” and “Game Storming” – in our very first google+ On Air hangout. Dave is using a lot of these interviews to collect material for his next book. A very interesting project to watch! Other interviewees in the series are Jeff Gotthelf (Lean UX, neo), Jim Benson (Personal Kanban) or Dan Mezick (The Culture Game). (Once you follow the video link to youtube, you will be presented other conversations in this series. You can also follow the series here.) In the beginning of the conversation, we discuss similar topics as in the previous mentions. In the end, though, Dave brought up one of Markus’ learnings of this year: The service design metaphor of the kitchen and the guest room in a restaurant. In this metaphor, the kitchen is the place where we do our regular work, composed of recipes we have ready (aka complicated work in Cynefin). The guest room deals with the complex world of serving all different kind of earthly and unearthly, sometimes unimaginable wishes of the client. The task of the few people commuting between guest room and kitchen is to understand the clients wishes, deal with the complexity and reduce it to the much simpler world of the kitchen and split it into those elements that can actually be delivered by the kitchen. Once the kitchen delivers the orders, the task of the waiters is, to create a great experience to the guests. For that, they need to understand all different kinds of wishes and frame what the kitchen produced in a way that it awes the clients. This metaphor combines the learnings of Service Design with the learnings of complexity theory. It is obvious that we are here talking about one way to solve the dilemma of work in the complex domain and then reducing it to a lower level of the complicated domain, to exploit what we learned and invented. I thought this is really helpful, and indeed since being introduced to the metaphor by Dave – I have found several situations where this thinking has helped to get a grip around that problem. We hope you like some of the content and if you are interested in having us speak at your event, conference or any other opportunity, please reach out to us.